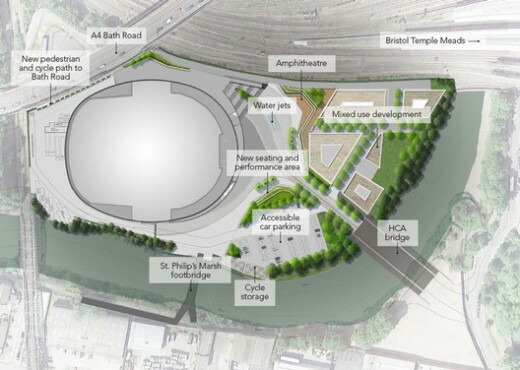 April 7, 2016 – Bristol City Council’s Development Control Committee has given the go ahead for the 12,000 capacity Bristol Arena and approved outline plans for the rest of Arena Island. Two applications were brought back to committee following a deferral last month to allow for additional transport information to be provided. 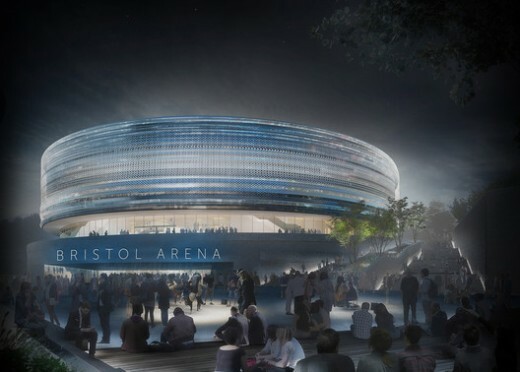 Designed by the Populous Arena Team, Bristol Arena is due to open in 2018. 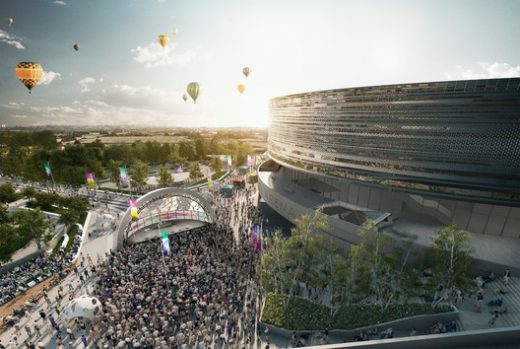 Strong support for the arena was expressed through the consultation with over 86% of respondents fully or broadly supporting the Bristol Arena plans and 86% of people suggesting that pop-up events and outdoor activities would help create a vibrant place. Following the consultation, plans have been developed further to show how event spaces in front of the arena can be used for performances, outdoor cinema, festivals and markets. Water jets will provide an area for play when events are not taking place and green terraces will create an informal seating area for picnicking or recreation. A number of concerns were raised during the consultation around access to the arena site, the quality of pedestrian and cycle routes (particularly from the south), traffic congestion and parking on residential streets. As a result some changes have been made to the proposals. – Additional ‘shuttle’ trains to run between Bristol Temple Meads and Bristol Parkway station for the largest 12,000 capacity events to reduce the number of cars driving into the city. – Temporary road closures of Cattle Market Road and Albert Road between Stanhope St and Feeder Road for large events on weekday evenings and Saturday evenings to ease pedestrian and cycle access. The council has also committed to putting funding aside to cover set up costs of parking controls in vulnerable residential areas and extend the hours of existing RPS controls as necessary. 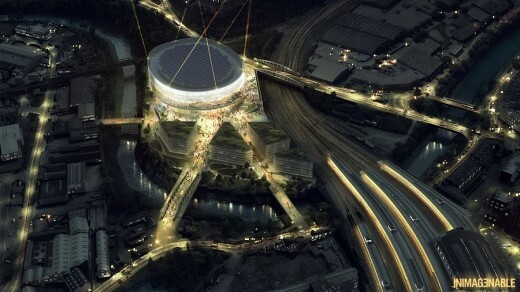 Proposals will be worked up in consultation with local people so that controls can be in place by the time the arena opens. 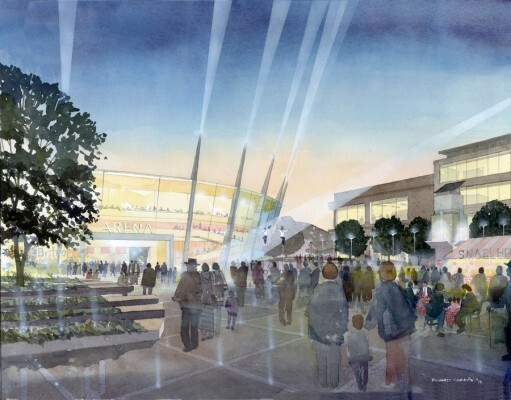 “The design for Bristol Arena has evolved and grown in detail over the past few months. The simple, elegant form of the lower plinth and upper elipse brings to life the idea of ‘ground and sky’. This creates both a strong civic presence and a dynamic, reflective surface which responds to the surrounding landscape. During daylight the curving form and reflective cladding catch the light, changing with the weather and season; whilst at night, with the facade softly illuminated, the striking form is most evident, becoming a new landmark in Bristol. 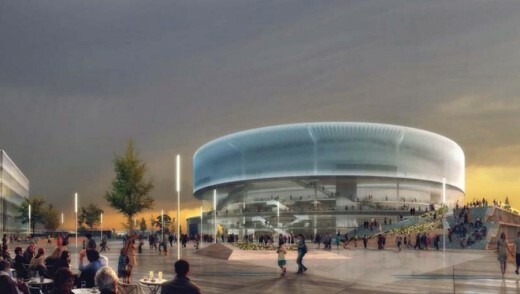 In addition to overall support for the arena, there was very positive feedback (85% fully support or broadly support) on the aspiration to create a highly sustainable arena. 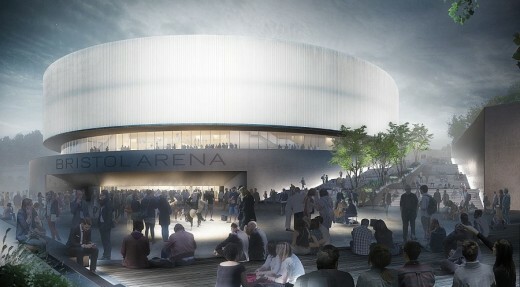 Following consultation photovoltaic panels have been added to the roof of the arena further boosting the venue’s green credentials. The council is also working with the operator to make sure sustainable methods of transport are promoted to visitors. 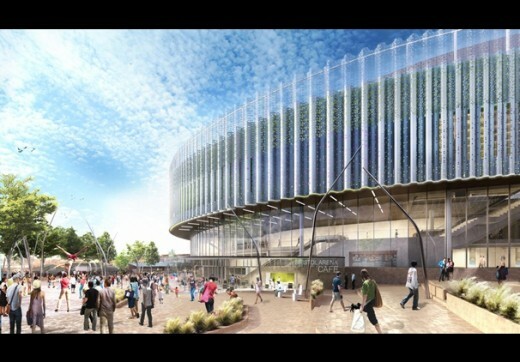 The material for the upper façade of the arena has also been changed from glass cladding to perforated steel. This allows for a more subtle lighting effect that will have a reduced light impact on neighbouring areas and has the potential to incorporate public art. 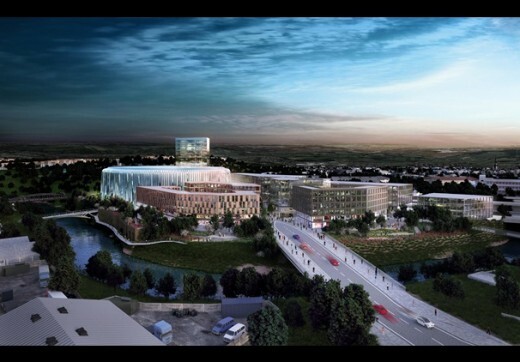 Two planning applications have been submitted to the council: a full planning application for how the arena will look and be accessed on the day it opens; and an outline planning application for how sites adjacent to the arena could be developed over time. Further information will also be available at the Central Library from 30 November to 21 December and online at www.bristoltemplequarter.com/arena. The submission of the planning application marks the start of a statutory consultation period on the plans. Further details and the full set of planning documents can be found on the council’s planning portal. 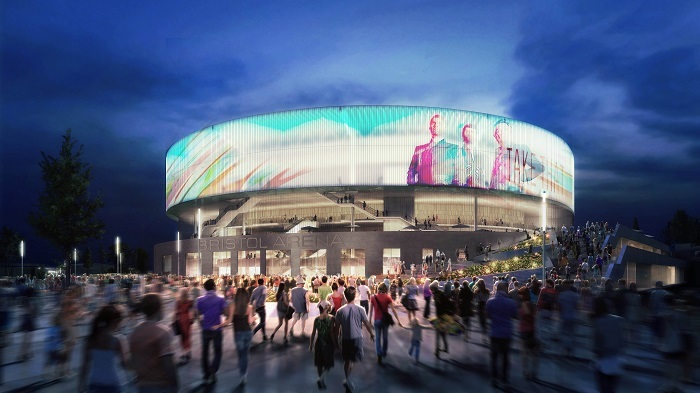 International design practice Populous have been named as Architects of Bristol Arena, bringing a world-class entertainment and sports venue, urban regeneration and international recognition to the city. The team brings together the expertise of entertainment and sports design firm Populous, award winning locally-based architects Feilden Clegg Bradley Studios, renowned international practice BuroHappold Engineering and sound specialists Vanguardia. 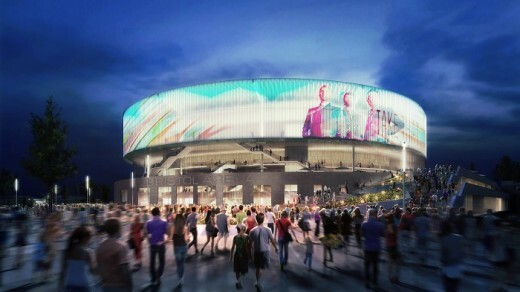 “We believe Bristol Arena will be the catalyst for the creation of a vibrant new quarter in the city. The design is flexible enough to cater for a wide variety of events and creates a range of spaces inside and out of the venue itself, for people to come together right through the year. 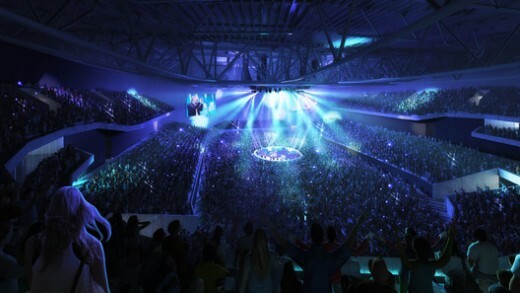 “Our design for Bristol Arena is unique. 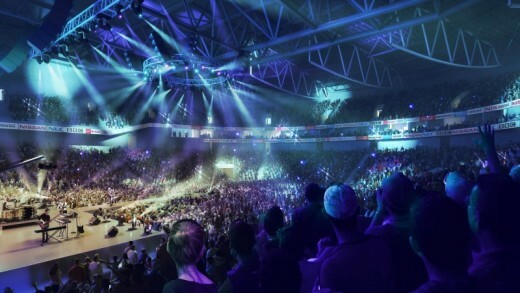 It delivers a world-class live concert venue for 12,000 fans and, with seamless conversion, the atmosphere and intimacy of a 4,000 seat amphitheatre. 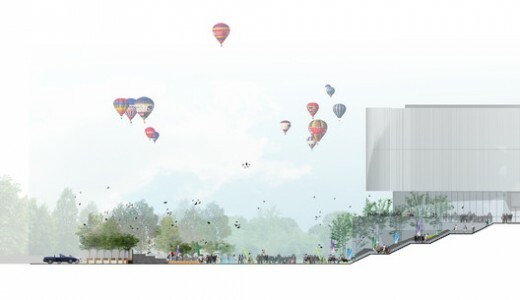 The adaptive façade will provide the canvas, defining the identity of the building within the Bristol skyline as it transitions between an ephemeral form by day to a dynamic event backdrop by night,” Reynolds said. 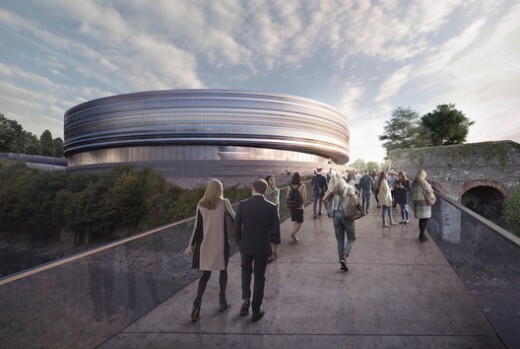 “Framed by the railway and the River Avon, the Arena has been designed to reflect the proud history and heritage of the city of Bristol, creating an iconic new form within the city, which is respectful and responsive to its unique location. While the masonry plinth base will reflect the surrounding buildings, the beautiful crystalline upper form will allow the arena to continually adapt to mirror the changing face and form of the city”. The Arena is designed to achieve a BREEAM ‘Excellent’ rating, making it the UK’s most sustainable arena – a fitting tribute to the 2015 European Green Capital. 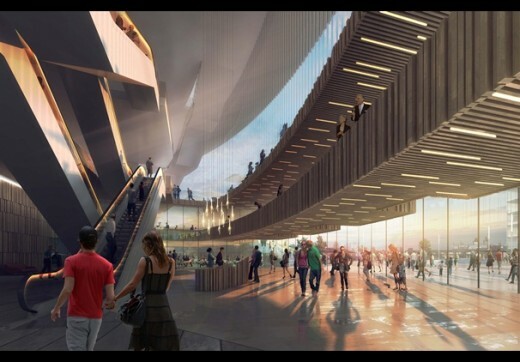 Using cutting-edge design principles, the arena will feature an innovative displacement ventilation system and provision for the biggest building-based photovoltaic system in the city. It will also help create a new cycle and pedestrian link between the station and the residential areas to the south and east. Populous is an international architecture and design practice with over thirty years of experience in creating environments that draw people and communities together for unforgettable experiences. In the world’s top cities they have designed more than 2,000 projects worth $30 billion, including 50 arenas. Their designs for places like the O2 Arena, Yankee Stadium, Wembley Stadium, Philippine Arena, and the London Olympic Games have created emotional connections between people and the civic, sports and entertainment places and events they love best.